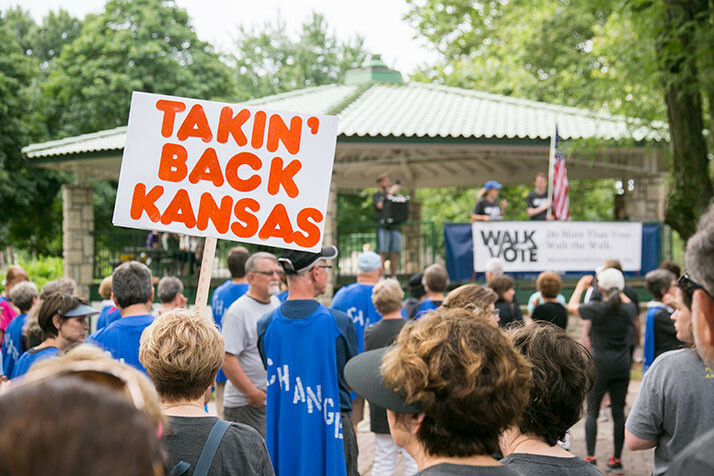 More than 500 people participated in MainStream’s inaugural “Walk the Vote” event Saturday in Overland Park. It’s still nearly a year and a half until the next statehouse election, but the atmosphere at Santa Fe Commons Park had the feeling of the thick of the political season. 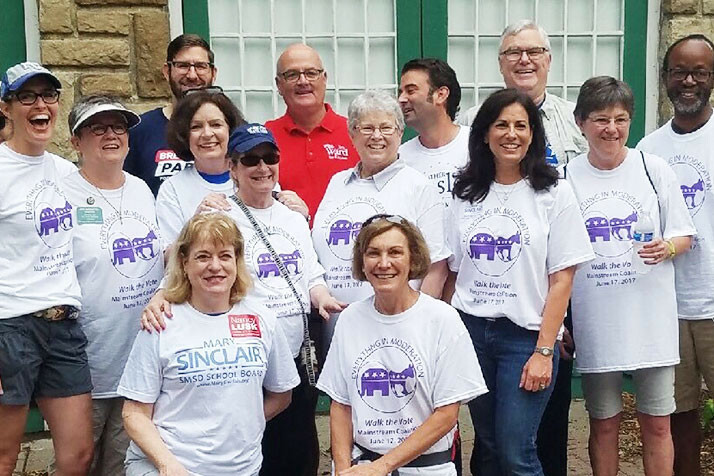 More than 500 people — including Republican and Democratic legislators from Johnson, Wyandotte and Douglas counties and beyond — gathered off downtown Overland Park Saturday morning for the first-ever “Walk the Vote” fundraiser for the MainStream Coalition. Billed as a “walk party to raise money to raise hell in 2018,” the event was envisioned as a way to “finish what we started in 2016,” said MainStream Executive Director Brandi Fisher. But that bi-partisanship was part of the appeal of participating for many. Corliss Jacobs was part of the team organized by the progressive group MoveOn, which used the theme “join us under the umbrella.” Though the MoveOn walkers weren’t afraid to champion views favored by liberals, Jacobs said the goal is to find common ground with people who are more conservative. 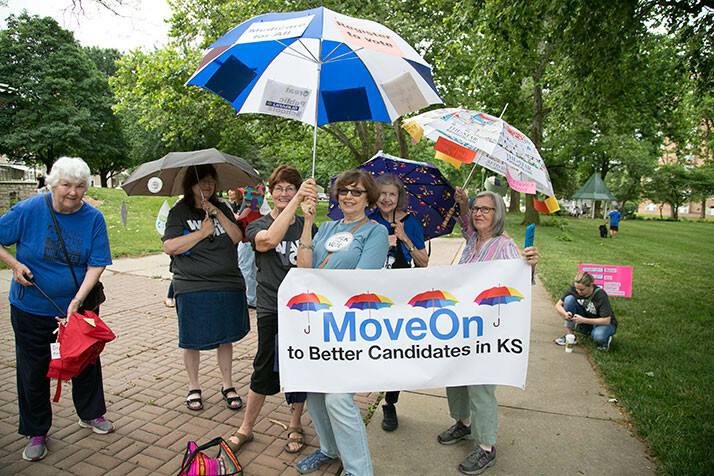 The MoveOn “Join Us Under the Umbrella” team. 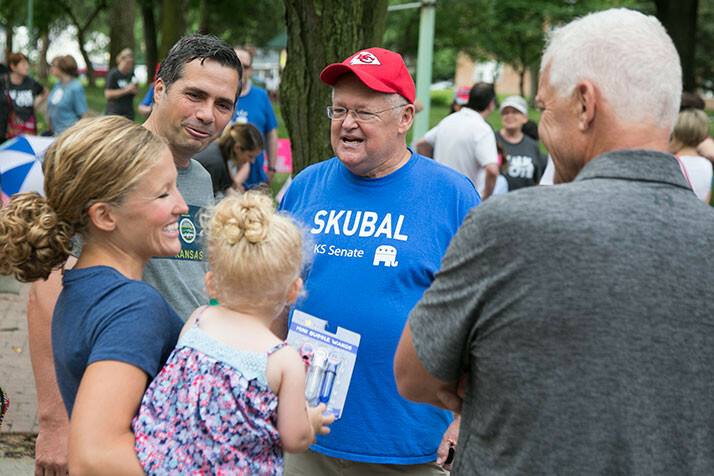 Former U.S. Senate Candidate Greg Orman and State Sen. John Skubal chatted ahead of the event.